Two local councils are both supporting a plan to see them join forces as a unitary authority. Preston City and South Ribble councils have agreed to the plan in principle and are both now carrying out work on the proposals. The plan would see the end of the current system giving district councils some jurisdiction, and Lancashire County Council wider authority. A financial assessment is to be carried out and the public asked their views. A White Paper is currently being drawn up by Ruth Kelly MP, Secretary of State for Communities and Local Government, and is expected to be published in October. It is thought the document will look at whether to extend the number of unitary authorities in England. In a joint statement, leader of Preston City Council, Councillor John Collins, Councillor Ken Hudson, Conservative group leader and Councillor Christine Abram, Liberal Democrat group leader, said that the areas needed to "be in charge of their own destiny". "It's an area that's on the up and cannot afford to be held back," they said. 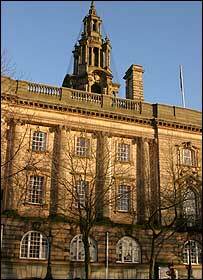 The new council would deliver services for a total of about 235,000 residents.